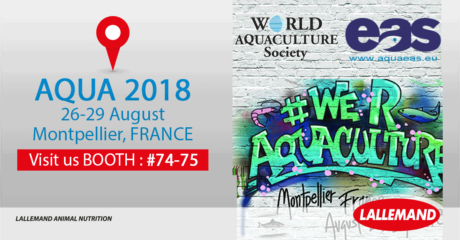 Lallemand Animal Nutrition is looking forward to welcome the world aquaculture industry to France for AQUA 2018 on Aug. 26-28 in Montpellier. The aquaculture team will exhibit at booth #74-75 and will share new results on fish immunity and antioxidant defenses during posters sessions and presentations. Lallemand Animal Nutrition is proud to support the AQUA 18 trade show and conference as industry sponsor. On Sunday, Aug. 26, Mathieu Castex, Ph.D., R&D Director, Lallemand Animal Nutrition, will present information on reinforcing mucosal immunity in salmonids through feeding yeast derivatives and probiotics and the development of a new DNA-based technique (1). Nicola Pontefract, a Ph.D. candidate at Plymouth University in the United Kingdom, will share findings on two salmon trials performed in collaboration with BioMar in Scotland (2,3). Effect of a single-strain yeast fraction on Atlantic salmon skin mucosal barrier and susceptibility to sea lice. Nicola Pontefract, Eric Leclercq, Mark Rawling, Victoria Valdenegro, Mathieu Castex, Daniel Merrifield.